Why anyone will drop Large Bucks on an original now I don't know , Absolutely fabulous! Part of the ultimate audiophile Prestige stereo reissue series from Analogue Productions featuring 25 Mono of the most collectible, rarest, most audiophile-sounding Rudy Van Gelder recordings ever made! "Analogue Productions has continued to push its own already high bar higher still. Its Quality Record Pressings plant is delivering the best vinyl discs to be found, its jackets and cover reproduction quality have hit new levels, and it continues to have the best in the biz — such as Kevin Gray for this series (25 mono LPs from the Prestige label's exceptional late-50s run) cut lacquers from original analog master tapes. One of the pivotal recordings in bringing about the widespread acceptance of Sonny Rollins as a major figure, Saxophone Colossus inspired critics to write scholarly analyses and fans to revel in the hard-swinging invention, humor, and tender-strength balladry. Up to this album, while most musicians recognized Rollins as one of the new influential forces in the jazz of the ’50s, most critics were carping at Rollins or damning him with faint praise. "St. Thomas," a traditional West Indian melody which Mal Waldron remembered as "The Carnival," was recorded by many artists after Sonny introduced it here, and it remains a jazz standard today. The contributions of Tommy Flanagan’s elegant swing, Doug Watkins’s steady lift, and Max Roach’s most musical accompaniment and soloing (hear "Blue 7") make this a landmark album. 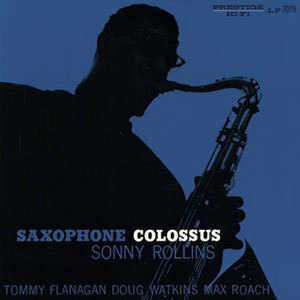 "Sonny Rollins recorded many memorable sessions during 1954-1958, but Saxophone Colossus is arguably his finest all-around set. Joined by pianist Tommy Flanagan, bassist Doug Watkins, and drummer Max Roach, Rollins debuts and performs the definitive version of 'St. Thomas,' tears into the chord changes of 'Mack the Knife' (here called 'Moritat'), introduces 'Strode Rode,' is lyrical on 'You Don't Know What Love Is,' and constructs a solo on 'Blue Seven' that practically defines his style."